When we go through some spiritual book or scripture, usually it follows a certain plan of organization. Similarly, it was intriguing to find that every chapter of Shrimad Bhagvad Gita starts and ends with the word Yoga. For example, first chapter is Vishad Yoga. I tried to learn this scripture from various sources and could not fathom the beauty or depth of this great manual for yoga centered living. Then, I got Shrimad Bhagvad Gita commentary by Shri Panchanan Bhattacharyaji, who writing had been directed and guided and endorsed by none other than Shri Lahiri Mahasaya. 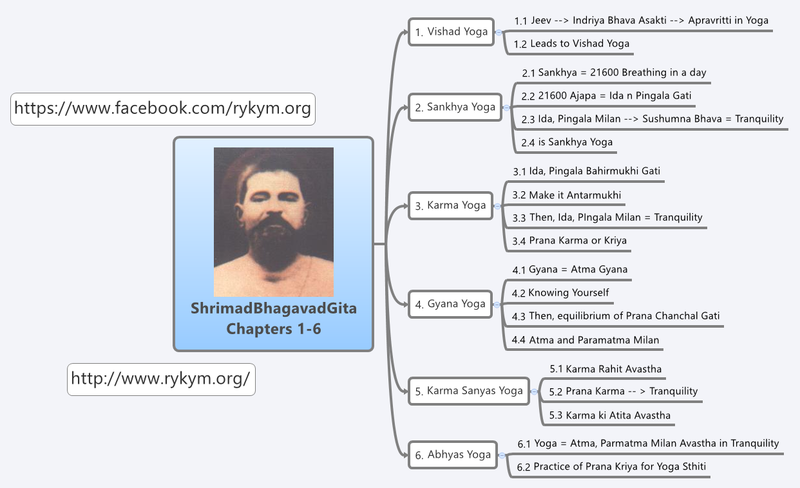 I went through the explanation of names of all 18 chapters in the light of Kriya Yoga. Together, these can open new vistas of deep reflection and relevance. Some scholars say that Shrimad Bhagvad Gita 18 chapters are divided into 3 sections – first 6 are Karma Yoga, second 6 are Bhakti Yoga, last 6 are Gyana Yoga. Shri Panchanan Bhattacharyaji described these names in the light of Kriya Yoga. You can download this PDF file containing the explanation of names of 18 chapters in the light of Kriya Yoga.